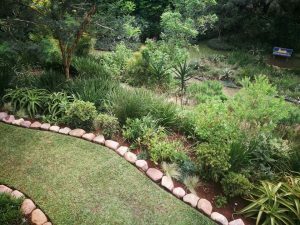 Getting a landscaped garden, designed to suit your property, tastes and budget is a simple process. Just follow the steps below. We will set up an appointment at a time that is convenient to you to discuss your needs and take a look at your garden. We will take photographs and measurements of your garden to ensure accuracy in the design process. We will go back to the office and design your garden, drawing a detailed plan by hand. We can then draw up a bill of quantities and quotation. Your quotation will be emailed or delivered to you for you to peruse it before we meet to discuss it. We will set up a meeting to go through the quotation and plan to ensure that you are entirely happy with our ideas. Here we will provide you with pictures or samples of the proposed plants. If you are happy with our designs, we will then discuss a starting date. A 50% deposit will be paid prior to work being started, with the balance on completion.